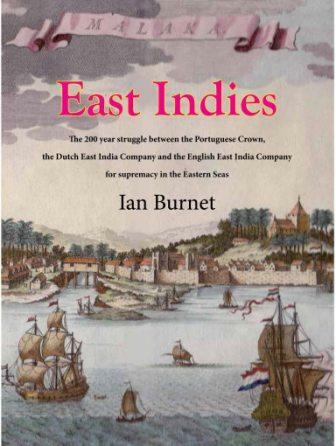 After 5 years of research, writing and rewriting, the next book ‘East Indies’ has gone to the printers and is due back towards the end of August. It is in the same hardcover format as ‘Spice Islands’ with 224 pages and 70 colour images. In 1497 Vasco da Gama rounded the Cape of Good Hope, his small Portuguese fleet reached India and became the first Europeans to sail the Eastern Seas. Over the next 100 years the Portuguese spread their trading network in search of spices, sandalwood, silks, gold, silver porcelains and other oriental goods. This trading network extended from Goa in India as far east as the Moluccas and Timor in Indonesia, and as far north as China and Japan. In 1595 and 1601 respectively, the first Dutch and English trading expeditiions rounded the Cape of Good Hope and the trading monopoly of the Portuguese Crown was being challenged by the Dutch East India Company and then the English East India Company, the world’s first joint stock and multi-national trading companies. For the next 200 years the struggle for trade supremacy between the Portuguese, the Dutch, and the English ranged across the Eastern Seas and in the settlements of Goa, Malacca, Ambon, Macao,Canton, Nagasaki, Batavia, Macassar, Johor and Singapore. Until by the end of the 19th century the Portuguese had almost vanished from the Eastern Seas, and the Dutch and English East India Companies had been transformed from trading companies into colonial powers ruling vast territories in Indonesia, India and Malaya. This book follows the trade winds, the trade routes and the port cities across the East Indies and the Orient. Beginning in Malacca which was one of the world’s largest trading ports in the 16th century and finishing with the founding of Singapore and Hong Kong which became some of the world’s largest trading ports in the 19th century. This entry was posted in Uncategorized and tagged banda, batavia, dutch east india company, east indies, english east india company, ian burnet, malacca, maluku, moluccas, ombak putih, seatrek, seatrekbali, singapore, spice islands, spice islands book, VOC. Bookmark the permalink.